"I may inform you that this Krishna Consciousness movement is not a recent movement, started a few months or a few years ago, but this movement has been existing for a very long time, dating back to the Vedic age. Without tracing the history of this movement, we can safely say that at least 5000 years ago, this movement was started from the Battlefield of Kurukshetra. Later on, it was organizedly recorded in the great voluminous literature, known world over as the Srimad Bhagavatam, and the very famous Bhagavad Gita, by the original author of Vedic literature, Shri Krishna Dwaipayana Vyas. Since that time, this movement is current in India, supported by great Acharyas like Ramanuja, Madhya, and Vishnu Swami, and Nimbarka. Later on, about 500 years ago, it received great impetus from Lord Chaitanya, and since that time, there are millions of supporters for Krishna Consciousness in India. 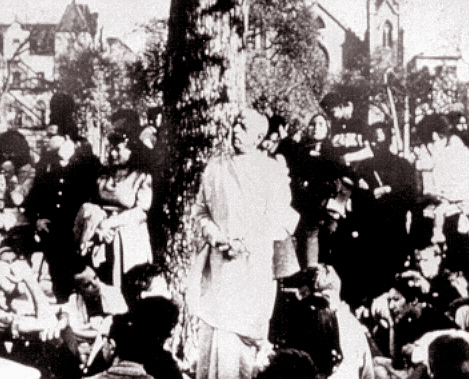 This Krishna Consciousness movement is still supported by conferences, seminars, and so forth, in several parts of India. Recently, we have started this movement in America, making New York as our center, with a view that we shall be able to attract the attention of the United Nations for spreading this important movement throughout the whole world for actual benefit of the human race."